The Joy Trip Project Article - Zack Giffin |EXPLORE. DESIGN. REFINE. Home is certainly where the heart is. And if you love skiing there’s no better place to settle down than a snow covered mountainside. But what if you could just pack up your house and cart it off to one world-class ski resort after the next? That’s the basic premise of Liv’in Tiny: A Quest for Powder a new film by Sam Giffin. 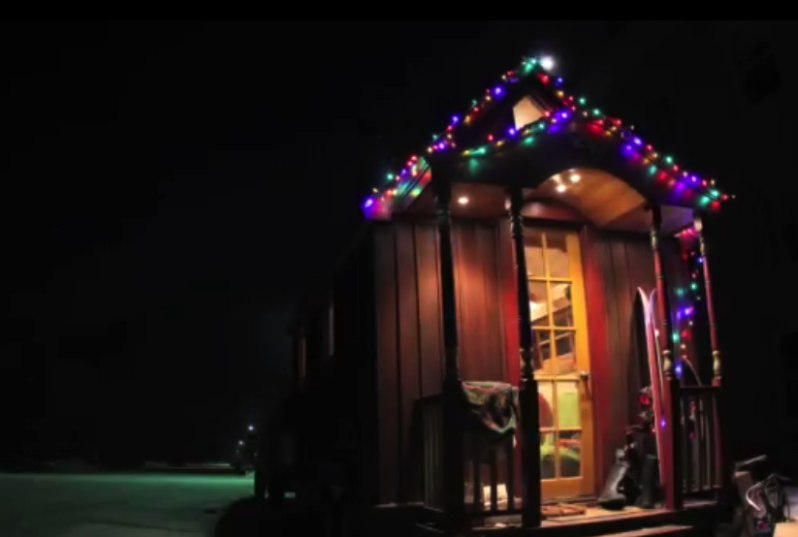 Right on the heels of last year’s A Down Hill Affair the filmmaker follows his pro-skier brother Zack Giffin as he makes his way across the Rocky Mountains in a home-built house on wheels. About the size of my living room (112 square feet) this pint-sized ski chalet sleeps five and provides a cozy little residence for a team of ski bums that includes Outdoor Research ambassador teammate Molly Baker. Hauled by a sketchy Ford truck called Rusty-D, the Tiny House and crew make it all the way to Canada. In search of fresh powder in one of the worst snow years in recent memory they head north to make a home for the season in Whitewater British Columbia where Rusty-D finally dies a fiery death. Nestled among the cars in the parking lot they enjoy incredible days skiing the best snow the winter has to offer. Not only does Sam Giffin capture breathtaking images of long high speed descents he succeeds as well in presenting all of the fun that can be had in life on the road that is indeed home.